What Would Sam Walton Say? - CHARTER SCHOOL WATCHDOG http://www.charterschoolwatchdog. It looks like we caught the boys breaking the rules -- again. 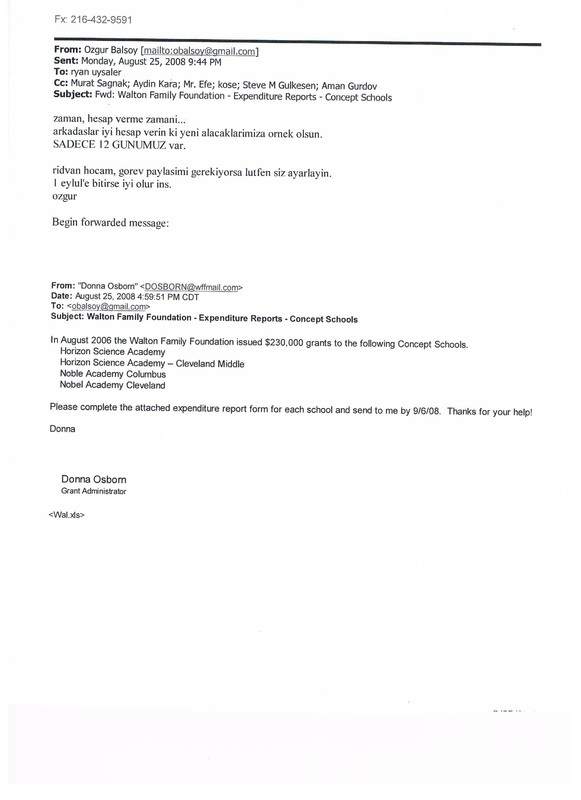 This time they have decided to misappropriate grant monies from the Walton Family Foundation in the amount of $230,000 that was awarded to their "schools." According to their own emails, the boys have been up to the old shenanigans, using money the way that they want to -- instead of the way they are supposed to. And now their creative accounting practices have caught up with them and they have to manufacture some bogus spreadsheets to send to the Walton Family Foundation's grant administrator. The "brothers," as they fondly refer to each other, admit that they have used the monies for items that they were not supposed to, like salaries, special education, insurance, etc. We have also attached the Excel spreadsheets that they have compiled, and are quite certain that they are not the ones that they actually sent to Walton. But don't worry guys, we will make sure that Donna Osburn gets a copy of your emails and excel spreadsheets. After all, that's what friends are for. 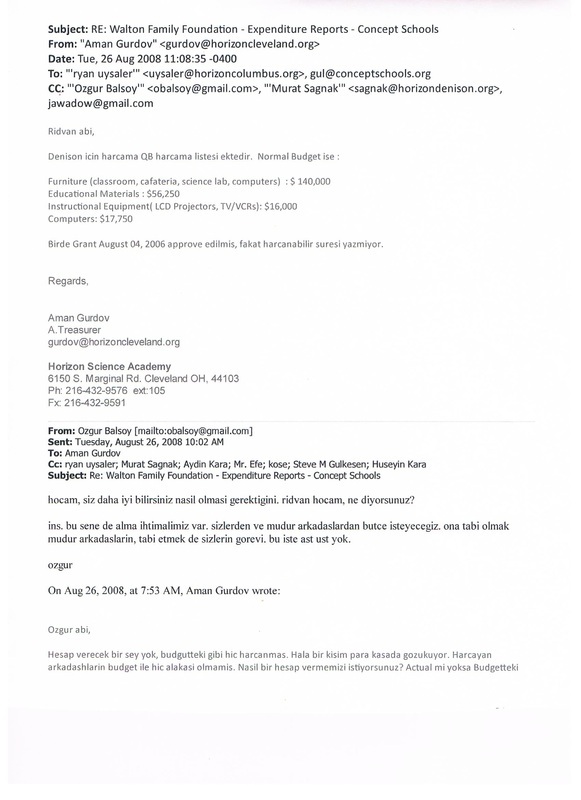 · Ryan Uysaler is also known as “Brother Ridvan” in the emails, Ridvan being his legal name and not his alias, “Ryan.” (And by the way, Ryan is also the whiner in the blog titled, "This Disgusting Country"). It is time to give an accounting of the expenditures. Brothers, you must give a good accounting of the expenditures so it will be good example for new incoming grants. We have only 12 days. 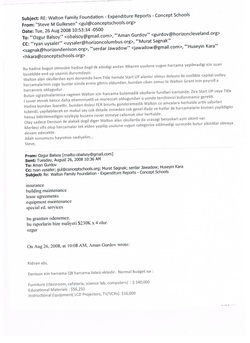 Brother Ridvan, if you need some work assignments, please arrange it. It will be good if it can be done by September 1st. In August 2006 the Walton Family Foundation issued $230,000 grants to the following Concept Schools. 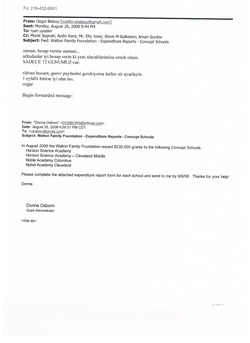 Please complete the attached expenditure report form for each school and send to me by 9/6/08. Thanks for your help! There is nothing to give for the account expenditures. The grant was not spent as it was supposed to be in the budget. There is still some unspent money in the account. People who spent the grant are not relevant to the budget. How do you want us to give the accounting? Actual or as it is in the budget? You know better, how it is supposed to be. Brother Ridvan, what do you say? God willing, we will have opportunity to get it again. 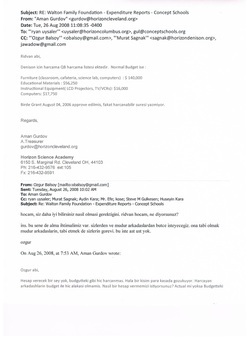 We will request the budget both from you and the other director brothers. It is the duty of directors to be subject to budget and it is your duty to make them subject to budget. There is no line relationship. 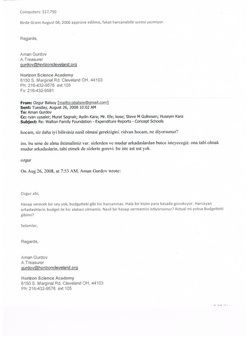 *Note: It would seem that when Ozgur replies, he is scolding Gurdov for acting like he does not know that he is supposed to lie on the expenditure report and not report the “actual” expenditures. Attached is the list of expenditure for Denison. Also, the Grant was approved on August 04, 2006, but it is does not have a written valid thru date. cannot be paid from this grant. This report will cost us $230K x 4. The schools that got the Walton Grant did get both Title I and Start UP grants too. So, since most of the capital outlay expenditures melted into these grants, the conclusion is that we spent part of the Walton Grant for payroll. 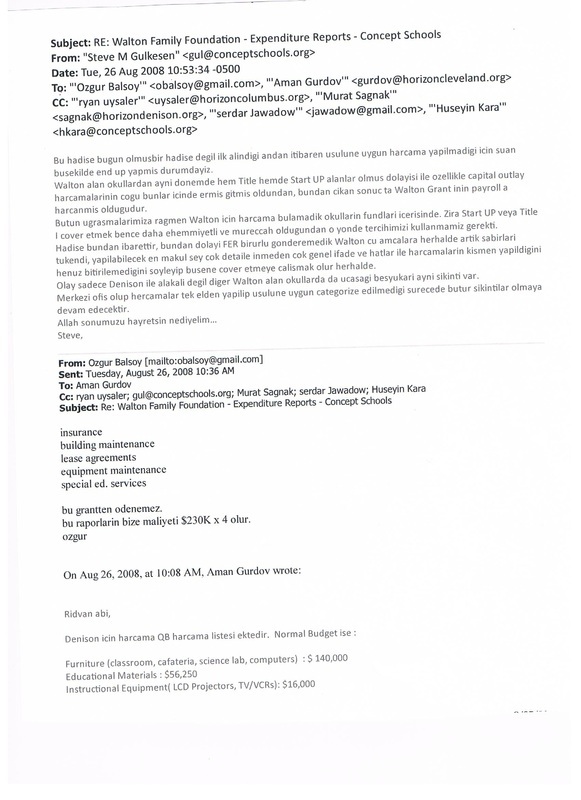 We could not find any expenses for the Walton Grant in schools’ funds. So, it is better to cover up Start UP or Title I. So, we could not send FER to the administrators at Walton and they are losing their patience. It is best to say that we could not finish spending all grant, we could spend some part of it without going into the details of expenditure. This incident is not related to only Denison, but also the other schools which got the Walton Grant have the same problem. We will face the same problems unless we have a central office and we make the expenses from one center.